I have been thinking about the seven medicines approach to healing that was created by Susun Weed. I utilize this a lot in my work. The first step is to choose the healing challenge that you wish to work with. I encourage my students and apprentices to be specific about what the challenge is, to not name it as a diagnosis or disease but you describe it as what is happening. There is a reason to get a diagnosis. It can be helpful to have the label so that you can work with others to discern what the best road to healing is. The diagnosis can bog you down. The diagnosis is not the challenge. The disease does not exist in and of itself. When you can move beyond the diagnosis, you can begin to heal. Here is an example. Someone is saying that they are suffering from depression. That in itself evokes a very heavy image. I can see how someone finally admitting that they are depressed can be very helpful. And yet, what is this person experiencing? Are they sad? Are they angry? Are they afraid? Are they withdrawn? Are they silent? To name the challenge that is depression is to say something like this, for example. Once you can say what the actual challenge is….then you can begin to heal. And once you name the challenge, then you can name your intention for healing. I am sad and angry all the time—My intention is to accept myself as I am. I am so anxious that I cannot do anything—My intention is to be calm and peaceful and to do what is mine to do. You will discover from this simple exercise that you may feel better. Being as honest as we can about where we are, and looking at where we would like to be in a good place to start. You may also feel overwhelmed about being so honest about what you are experiencing. It helps to have someone to share this with individually or in a group. Once you have named your challenge and your intention for healing, you can move on to Serenity Medicine. This is to acknowledge the challenge and to know that it is and will be taken care of. The next medicines after this are Story Medicine, Energy Medicine and Lifestyle Medicine. The Seven Medicines Approach is offered in the Wise Woman Tradition. It is about wholeness. And the Seven Medicines approach allows you to find your beauty as you heal. May your challenges guide you deeper and make you stronger. It is summer in my wild garden. The blackberry brambles are weaving their way into the other plants growing. I feel vulnerable when I am out in the garden. It takes some time for me to calm down into what is really going on out there. At first I feel overwhelmed, shouldn't I be cutting back all these plants. What about these grasses? Aren't they taking over the garden. What about the buttercup? I feel emotionally activated by my conditioning. As I spend time outside in the garden a little longer, the plants begin to communicate with me and I start to relax. The seeds of the yellow dock are about ready to harvest. I notice the brilliant lamb's quarters, so happy and green, even in the heat. The chickweed has found a shady spot to keep growing. And the apples are plump and abundant. There is a sow thistle plant in the garden that is at least seven feet tall. The leaves are shiny and waxy and the seed heads are like moons. I pay particular attention to the comfrey.....because I got into a somewhat heated conversation online about whether comfrey is good for internal use. It has been good friend for so long. As I am leaving the garden, I talk to the comfrey especially. She says, "My brain. Your brain." And then she says, "If you rely too heavily on the scientific tradition, you will not use plants for what they are intended." My garden continues to be a powerful teacher for me. When I look at my life through one lens, it can appear overwhelming and I can see messes and tangles. And when I settle into life and look again at what I am creating, I see each particular aspect and what is needed for it right now. It has been difficult to express in words what I feel about the shootings in Orlando. When I attempt to come to terms with it, I feel stopped by a grief that is deep and quiet. I don’t understand why this has happened or why this has to keep happening. I didn’t know the people who died or were injured, but somehow I feel like they are me, they are my family. I feel an interconnectedness with the ones who were killed, who were injured and for the families in their grief. I feel an interconnectedness with the gay community. I am them. We are we. I feel connected with everyone. In my thoughts of years past, I have felt that there is no “they”. But somehow now I see how this is true. I mourn for you who have died, like you are my own, because you are. My question to myself has been, “What am I going to do about this?” So far, lighting a candle so I can remember. I don’t feel angry, which may come later in working through the stages of grief. But for now, I feel compassion for everyone involved in this. “Why has this happened?” brings me to seeing that even though we can blame this person, this religion, this politician for what has happened, we can’t really say “why” because it isn’t really known. “Why?” is a way of trying to figure it out so we can move on. It is okay to not move on. To be with the tragedies that happened and to allow our feelings to be what they are. Each of us, as we seek to understand what has happened, can do something. What is yours to do? This is a way to allow the feelings and not succumb to the victimization that can occur when we feel such sadness and hopelessness. Some things that I have found to do are, talk about herbs for healing grief, do psycho pomp shamanic healing, continue prayers for peace, send herbs for healing grief to a center in Florida. What is yours to do? Perhaps it is to express yourself even more fully, to embrace life as a celebration, in remembrance of souls who has left us. It is what you feel in your heart that you can do. As we allow and heal grief, one of the things that can be beneficial to our souls is to spend time in nature, to breathe and to be. The plants offer support and comfort for us. The Trees: The trees that grow near you, standing tall over you are guardians. Standing with your back up against the trunk of a large tree, breathing as though you are breathing the very breath/oxygen of this tree into your lungs, breathing out offering your breath to the tree. This can bring stability and even joy. Rose-Rosa spp. : Rose and specifically wild rose support the cultivation of the space of healing. It is heart and soul medicine. You can utiltize it topically, as a tincture, infused in vinegar or as a tea. St. Joan’s Wort-Hypericum perforatum: This wonderful plant uplifts the spirit. It is utilized by people who feel depressed, trodden down by life. I find it to be very supportive for those who are grieving loved ones. Hawthorne-Crataegus monogyna: I make a tincture of the leaf and flower. This plant heals the heart, it knows what the heart requires. It calms agitation. Oatstraw-Avena sativa: This is a nourishing herb. Put one ounce of dry oatstraw in a quart size saucepan, fill with water. Bring to a boil, turn this down and simmer it for up to an hour. Strain and drink. This supportive plant will nourish your nervous system. Lavender-Lavandula spp. : This is the happiness plant. 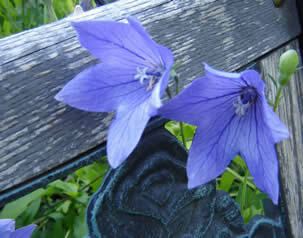 Even though this plant is said to help you sleep, it is not a sedative. It is gently calming and center for us. I like to infused lavender flowers in honey and then add to my tea. Stinging Nettle-Urtica dioica: Nettle is the most nourishing of all plants. 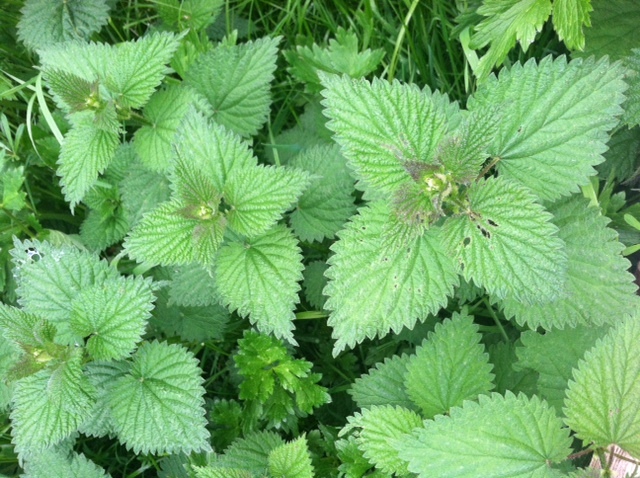 When we are feeling a lot, nettle can help us by offering us a mineral rich infusion. Nettle moves and strengthens our energy so that we may stand strong to do what is ours to do. Nettle infusion is best. One ounce of dry nettle steeped in one quart of boiling water overnight. Strain and drink. Nettle infused vinegar is also very supportive of our energetic system. Dandelion-Taraxacum officianale: Dandelion’s flowers incorporate the sun’s energy. You can harvest a couple of flowers, put them in a mug, pour boiling water over this, sweeten a little with honey and be uplifted. Dandelion is said to be the most generous of all plants. This is because it is always there, sharing its gifts. Even when people try to irradicate it, it continues. In healing the grief of someone trying so desperately to irradiate a certain kind of people, Dandelion can support our continuation, our strength and conviction and our willingness to keep believing that we can bring the change that is needed. The leaves of dandelion are bitter and encourages healthy digestion, which in turn encourages healthy immune system and healthy energetic system. We need this, don’t we? And the root of the dandelion, offer us the deep rooted strengthening of our wholeness that supports us as we allow gratitude and compassion to grow in us…even when we want to give up. Dandelion is related to the liver which is related to the emotion of anger. This plant can specifically support you to move through intense anger, subtle anger, depression which is internalized anger and come through into a grounded sense of what is mine to do. Apple-Malus domestica: I have learned quite a bit from the Gravenstein apple in our meadow yard. The most precious teaching has been to love myself. Love every way that we are. Love never ends and it may begin within you. Apple sauce, apple butter, munching on an apple, apple pie, apple coffee cake…..so many choices. Motherwort-Leonurus cardiaca: This plant has supported many people to calm anxiety and to feel comforted. It is healing for the heart, the nervous system, the womb. I have found motherwort to be an embodiment of the Goddess. Green in spring, passionate pink in summer and she becomes a thorny hag in the fall. Comfrey-Symphytum uplandicum: Comfrey is the comforting one. It seems somehow appropriate that this plant has a reputation being detrimental when it is really not. This offers us a mirror for ourselves. Where do we see things that appear harmful, but they are indeed beneficial. I make an infusion of the comfrey leaves, one ounce of dry herb, steep in one quart of boiling water overnight. It will knit your bones, your wounds back together. There are many more plants that others will share as well. May you find comfort and peace in who you are and may nature bring you solace. Wild Roses~What is Personal and Invisible. 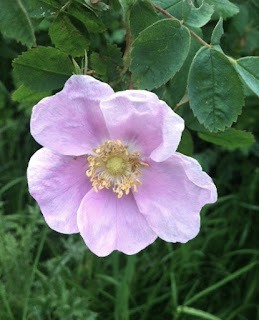 It has been many years since I discovered the wild roses growing in abundance on our land. We moved here in December and I did not know that the thicket down on the land was over an acre of roses. It has been a beautiful and miraculous journey since then. After the wild rose harvest on our land. to wait until they were dry of rain water. I made a gallon of infused oil. I have always had the rose as my ally and my teacher. I grew up with rose in my mother’s garden and when I became an herbalist I would go to places around Puget Sound in search of wild rose and harvested what I could. And then we moved here. I had only scratched the surface before. I began to listen to the wild rose and what she had for me on our land. So many years later, I have just completed another Journey of the Rose Weekend…journeys with rose, stories from rose, crafting with rose and harvesting an abundance of rose. The way we work with the wild roses here on our land is very personal. Shamanic listening exercises are offered to bring you into intimate relationship with rose. You discover things about yourself. The roses mirror what is true about you and shares this wisdom with you. What about the more linear description of healing with wild rose? Wild rose is anti-viral, anti-bacterial, calming for the nerves and heart and softening and healing for the skin. Amongst many other healing properties. How does that fit in with the invisible teachings of rose? These linear ways of working with plants grew out of the old ways that are more personal and invisible. The old ways have been left behind in many teachings about plants these days. There isn’t a separation between the invisible teachings of the plants and its physical properties. There is only wholeness. In fact, the physical nature of the plants is essential in connecting with the plant’s wholeness. When we partake of an herbal preparation that we have crafted from the plants, we receive its wisdom…what it has for us. This personal connection that the plants offers us is in the vinegar, is in the tincture or oil. We receive its wisdom when we receive its nourishment. What wild rose has offered people again and again is a shift in perspective, from one of suffering to one of possibility. This quality is not overt, it is mysterious and subtle and one may not even realize it is occurring. The beauty of the flowers, the fragrance, the contrast between the dark green leaves and the fuchsia-pink blossoms and the thorns all play a part in the wholeness and healing of wild rose. Within the physical is the spiritual...within the spiritual is the physical....this is wholeness. There is richness in the wholeness of healing in the shamanic herbal tradition. And though there is a great deal to learn and explore, this way of healing is uncomplicated and natural. I began writing about wildcrafting yesterday and although I got a lot of my ideas into the writing, I felt like something was missing. Then an apprentice graduate of mine came to pick me up and she and I and two small children went out to harvest plantain from our church’s grassy meadow. I felt like we were done and had gotten what I needed for infused oil but it appeared that the plantain was not done with us. It wanted us to keep picking. It was so happy to have us harvesting its leaves. What I want to communicate in this essay about wildcrafting is how to be respectful of the earth and the plants, how to not over harvest etc. And……that the plants want us to harvest them. They are calling us to them. They are waiting and waiting for us to notice them and see what gifts they have for us. I am a wildcrafter. I harvest plants mostly from my garden and on our land to make herbal preparations. I utilize these preparations to make salves and lotions, vinegars, sprays, tinctures. I have a small company where I sell products. I also make herbal preparations for use by myself and my husband. I have been noticing that more and more people are interested in harvesting wild plants for food and medicine. I have grown concerned that it is getting a little out of hand. I feel very protective of our natural resources, our wild plants and their ability to continue. I hear a lot of people on herbal forums asking if this plant or that plant is medicinal. Can I work with this plant? What can I do with this? 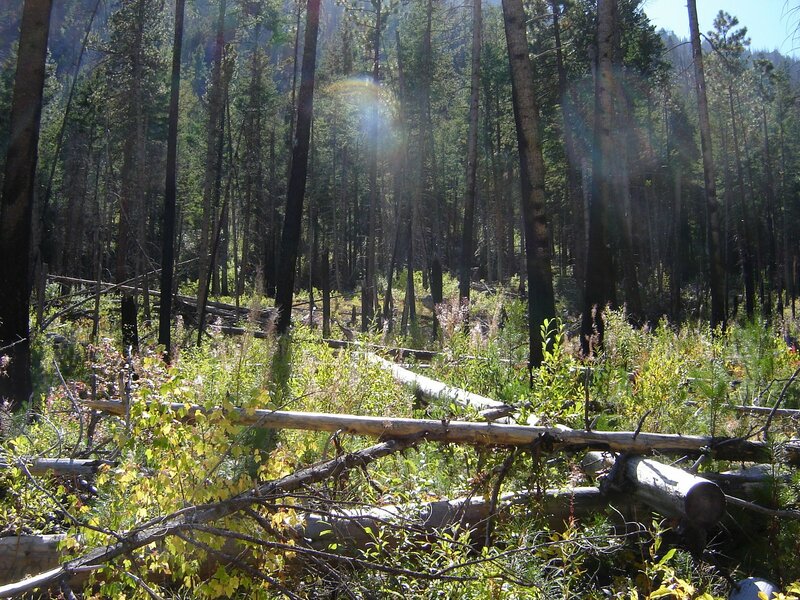 I understand the excitement about finding out you can gather and eat food right from the forest or the meadow…you don’t have to go to the store. I can understand the amazing idea that you can heal yourself with wild plants…you don’t have to go to the doctor. There is a respectful way to wildcraft plants. There is a sacred way to harvest. Get to know the plants that you wish to harvest. Spend time with them observing them. Breathe with them and listen and see what wisdom they have for you. This isn’t just 15 minutes before harvesting that you are going to do this. I recommend, taking a year to get to know plants to which you are drawn, just a few. Find someone from which to learn practices of connecting with the plants. Help them harvest so that you can learn respectful ways. Ask permission before harvesting. If you are in the wild, find out if this is a place you are permitted to harvest. Ask permission of the plant. Wait for an answer. Only harvest if you get a yes. When your harvesting is complete, say thank you. Don’t clear cut. I instruct my apprentices and students to pick here and there so it doesn’t even look like anything has been touched. Only harvest if there is an abundance. If there is very little, leave it. If there is just a moderate amount, only take what you need. Be very careful to not disturb the landscape when you are harvesting. Tend your gathering places. What is needed for these plants to continue? Don't give away your gathering places. I will take apprentices and students to my gathering places at times, but I will not tell someone where to go to find a plant. Understand that when you are digging up a plant by the roots, you are giving death. Even though I said it before, I think this is the most important thing. Gratitude. Be thankful and gracious with the earth and the plants. Wild Roses in our little meadow yard. Today I went out in my yard and gathered wild rose leaf and flower to make wild rose infused oil. When I looked our over the thicket of wild roses, it appeared there were so many to harvest. And yet, when I got down and stood before the roses, there weren’t that many. I looked and I listened and I knew to harvest this one and that one. I knew where to cut and I knew when to stop. I am pretty confident now as a wildcrafter. I have learned to accept my vulnerability as part of the process. I felt this overwhelming sadness as I gathered the roses. I was alone and for some reason I felt very lonely. I felt like I needed more friends. And then I noticed the nettle, and the birch and beech trees. And they helped me remember that they are my friends. It is vital to allow feelings to come forth when wildcrafting. What seems like a task of “let’s go out and pick some stuff” is really a dance with nature. The plants are communicating with us as we harvest. There are plants that are for us and plants that are not. There is wisdom in that invisible space that comes forth when we slow down and breathe with the plants. There is a timelessness that crosses centuries when we become present to the task of wildcrafting. Take time to listen. The plants are teaching you. Sometimes I find myself just looking at the plants in the garden. I look up at the trees. I notice a blade of grass, its shape, its sharpness and its bright green leaves. I see and then I see more deeply. When I first started studying herbalism, I would look at the plants to identify them or I would wonder if there was anything medicinal about this or that plant. What I didn’t realize was the plants were studying me also. And that as I breathed, the plants received my breath. And as the plants breathed, I received their breath. This communication guided me deeper into the invisible world of the plants. I realize that I was open to it, even though I didn’t know it. I didn’t feel like I knew anything about utilizing medicinal herbs and I felt vulnerable and inadequate a lot of the time. Because of this openness to my not being very good at remembering, herbal actions or botanical names or what this plant did or that plant did, I was being prepared for my journey to become a shamanic herbalist. When I learned to listen to the plants and what they had for me, I became confident and skillful. I have been doing this for almost twenty years now. I have been listening, breathing and being present with the plants. What I have discovered from doing this and teaching it, is that it doesn’t matter whether you know anything about the medicinal qualities of the plant to receive wisdom and healing. You can listen to a plant and hear a message of wisdom. You can harvest that plant and make an herbal preparation. You can utilize that herbal preparation on your food, as infusion, as tincture, in honey…..and what the plant had for you will be received by you. This is called plant cunning. This is the very old way of being intimate with the plants. This is the way of exchanging energy with the plants. It isn’t medicinal. Plant cunning is a way to contact the whole plant as a wisdom teacher and dance with it, sing with it, be present with it. What you discover in working in this way with a plant, is that you become expansive and connected into the invisible worlds around you. You begin to experience a more expansive realm of presence. This isn’t a fancy method. This you can do it with a blade of grass. You can do it with your kale plants. There is a vast amount of wisdom that the plants are holding. They want us to connect with them and receive it. They are waiting. Go outside and find a plant to which you are drawn. Breathe seven breaths, breathing in the breath of the plant you have chosen and breathing out offering your breath. Hugel Bed: First we added fir cones and bark. I have written about my garden transformation many times. It continues still. Yesterday, one of my apprentice graduate brought her apprentices to my farm and my garden to build another hugel bed. It began when we first moved here. The very first year of my garden, it was completely cultivated. So many vegetables, flowers and herbs. It was magnificent. And then I began to teach my classes in shamanic herbalism here and offer apprenticeships for women. My time to garden became less as I began to teach more. The first couple of years I still cultivated quite a bit and I started noticing that I liked the grasses that were growing in the garden, I like the weeds a lot. I became somewhat enamored of the Canadian thistle. And I also felt guilt and shame around not having garden that looked like it was supposed to. Hugel Bed: Next we added apple sticks. I would make excuses when people would come to my garden about why there were weeds and grasses where beautiful groomed plants should be. One person even made a comment about how my garden wasn't what she expected. 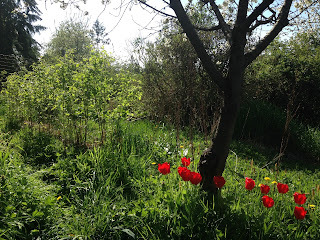 It became a source of anxiety for me to love the wild plants, the umkempness of the garden and the thoughts that ran through my mind that I should just get it together and have a groomed garden. A few things led me to a new way with this. I teach shamanic herbalism which has a lot to do with the invisible space where you can here the plants speaking to you. 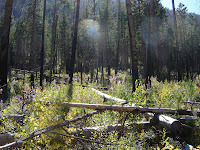 My practice was getting deeper and deeper as I communicated more and more with the wild plants. I had learned practices at a yearly gathering called, The Fairy Congress about communicating with the elementals, the fairies and other beings that did their magical work on the land. The last time I attended this conference, I ended up sitting next to and conversing with a number of different bee keepers about their practices. wasn't really on board with me about this and then she quit. I had a physical challenge at that time and so I really needed the help. I was in shock for a few days since it was June and the time was ripe to really do some gardening. I could have freaked out about this but instead I had this bright idea to let the garden go wild. I called it rewilding. I didn't pull weeds, I didn't plant seeds. I just let it go. I wasn't sure what I was doing. I wondered what would happen. What happened is that I began to also let go of the guilt and shame and anxiety that I had about making it perfect. And what else happened is that I began to communicate with the being that inhabited the garden. I had always loved the insects, the bees and the ladybugs and the beetles. I had grown to like the wasps, telling them they could stay in the garden if they didn't bother me. But then after returning from the Fairy Congress and allowing the garden to rest in its natural form, I noticed the insects were communicating with me. I learned that they are messengers and that they were coming around to tell me things. I rewilded the garden for over two years....letting it do its own thing. Hugel Bed: And then we added plant compost. And then I was introduced to a man, Masanobu Fukuoka and his book, The One Straw Revolution. In this book he talks about his transformation from being a scientist studying disease in rice, to a farmer who practiced natural farming. He said most people talk about doing this and doing that....he said what about not doing this and not doing that. I found his writing to reflect a Taoist perspective. What he was talking about in his book was what I was yearning to do, and I was doing it. That was last year. And then a friend sent me information about hugel kultur a type of permaculture gardening. And I was excited. I was going to do this. And I did this with the help of a very inspiring young woman, Sophie Geist. We just built our eighth hugel bed in the garden. The other thing I am doing or not doing is weeding big patches of grass out of the garden like I have done for years. We are cutting the grass and cutting some of the buttercup and disturbing the soil ecosystem as little as possible. The Hugel Bed is complete. The is a beginning for me. Right now when I go out in my garden, there is this little “field” of buttercup with the horsetail male flowers emerging from it. There is swamp grass and amongst it is comfrey, marshmallow and elecampane, some mustard and motherwort. There is a lovely pie cherry tree with red tulip blooming below it that are naturalizing and spreading. There is a wild rose that showed up a few years back and near it is a native crone wort plant. I love my wild garden. I can breathe in it. It makes me happy like when I was a child in the little grassy vacant lot near my home. Like it was stinging us but we weren't touching it. Nettle transformed us again this year. We could feel the energy of nettle sitting next to it. Like it was stinging us, but we weren’t touching it. The greening of the heart. Nettle is the reason I am an herbalist. I admit it. I go on Facebook. There are many herbalists and plant enthusiasts there. I like to hear what people are doing with plants and sometimes I feel competitive, not good enough, left out or even scorned for the kind of herbalist I am. I know that this is my own transformational journey to become the kind of herbalist that I am fully. In some ways Facebook is a good tool for discerning my identity. Without it I may not know what kind of herbalist many other people are. The scrutiny has actually helped me to be clearer about what I am offering with the plants. Before this social media thing, there were herbals and conferences to let me know what people were doing. Now that I have said that, I want tomake it clear that other people’s definition of “herbalist” doesn’t have to be mine. That scrutiny and criticism, scorning and competition are not part of being an herbalist. These are the mindset of someone who is over thinking who they are instead of seeking and knowing who they are. I have been on that road, and have veered off it. I am on my own path into the woods. I am a shamanic herbalist. I communicate with the plants around me as companions and wisdom teachers. I have developed intimate relationships with the plants with which I live. I seek them as teachers. They have told me that they want me to constantly be talking to them. I also eat these plants and I make herbal preparations with them. I know which ones offer themselves for this because I ask them if I can harvest and they tell me yes or no. In the past, I have thought that I should study clinical herbalism, study more deeply the science of plant medicine. Whenever I sought to move forward with this, there was a deep resistance in me. What I finally discovered is that the studies being offered were in rooms with power points and white boards and fancy words and I did not want to be with plants like that. And yet, the scientific information about the plants fascinates me. I want to know more and more of it. I want to discover new ways of utilizing the plants for healing and to know how others have done that. I read and I read about it. Here is how I can explain it. As I have spent hours and hours with certain plants in my yard, listening to them, allowing them to teach me, listening to my apprentices and students learn from the plants and what they have for them, I have developed familiarity with who the plants are. As I have prepared the plants for tincture, vinegar, infusion, honey, oxymel, infused oil, I have developed communion with the plants. As I have utilized the plants for healing and seen others heal by utilizing the plants, I have developed intercommunication and fellowship with the plants. When I read a plant study, or an herbal monograph or a description of the medicinal qualities of the plants….well, if it is one of my plants then I listen for the connection I have and see how that information serves me or doesn’t serve me. If is is a plant I don’t know about, I develop my curiosity about this plant and whether it is one I desire to get to know better. The scientific information about a plant is linear. It is fixed information. Knowing nettle has a lot of calcium in it is beneficial to me because I know that this will support the health of my bones. 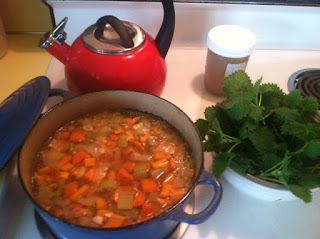 Knowing nettle as a friend and teacher, drinking nettle infusion and eating nettle is much more beneficial to me. I understand nettle intimately and I can feel its benefit. Nettle communicates with me in a language of the senses. I discern nettle’s teaching and benefit for me in her breath that she offers me, in the taste of her infusion, in her sting. I hear nettle messages on the wind, wisdom messages that change me. This is the kind of herbalist I am. Stride after perfect health and become lame. Blameless, she give herself permission to be exactly who she is." We are still in the liminal seasonal transition from winter into spring. There are stirring under the earth, there is awareness from all of earth creatures that spring is coming, as promised. And yet the earth still rests until it is time. We may be impatient, getting ready but its not yet. And the earth still rest until it is time. The moon is also waning and by Monday it will be a new moon, a dark moon. The end as well as the beginning. This is a good time to do nothing. In Susun Weed’s process of 7 medicines, the first medicine is Serenity Medicine. We know what we would like to heal and we allow some time to “do nothing” about it. To allow healing to come from nature, our inner natures and from the invisible. ignoring our challenge. And worse yet, that we are in denial about what challenges us. And yet, what we do when we practice serenity medicine is to honor the still, small voice of intuition that we can hear when we quiet down. In the shamanic tradition, power is not something we have, but something that moves in us. We are the hollow bone, the reed flute, the tree that bends in the wind. When we allow a time for quiet and rest, for listening and allowing, we create the space for healing to happen. Serenity Medicine is about trust. We can trust the process of life to point the way that we need to go. I find serenity medicine is the most difficult medicine for people to practice. It isn’t easy to let go, to trust, to allow. What happens when we do practice serenity medicine is that we cultivate vulnerability, openness, willingness, honesty and self love. Nature teaches us well so that we can learn this practice. If there is something that you wish to heal, a challenge that you have with your life, something you would like to shift. Take some time outside to notice your surroundings. Notice what nature and the plants are doing right now. Pay attention to your breath and breathe with everything you are experiencing. Offer gratitude for the moment. It is good to have a time limit for serenity medicine. This is so we don’t lapse into thinking that action is not required at all. It is a dance to flow and move in time to our inner rhythms. To know when to stop and then when to go. In the old teachings, this time of year, near the beginning of February was when the first green appeared. It is almost beginning out there. The earth's energy is still deep down. But now there is a slight stirring, a quickening of earth energy that will soon begin to move out and up. There is impatience present all around me. I can feel it. I feel a strong desire to be in the springtime energies, to be in my garden, to see the plants, to see the nettle growing, the leaves emerging, feel the warmth of the sun on my face. And yet, it just isn't time. Is the earth impatient as well? Does she wish for the seeds to be already sprouted? Does she long for the fragrant rose leaves, the prickly nettle, the magnificent maple to be adorned in her splendor? Perhaps the panic, the race of the heart, the irritability, the longing for something better is what comes before the green. All ways of feeling are beautiful in their own way. Feeling sad and hopeless can lead us to a deeper understanding of what we desire. Being anxious can lead us to create what we desire. Being angry and impatient can lead us to set clear boundaries for the life we wish to live. Being calm and composed is over rated. Sometimes the wild woman beast in us needs to be unleashed. Where can you express that? Who would you be if you knew that what you are feeling is calling you into a deeper experience of life? Think of the dandelion that pushes itself up through the concrete to meet the light of the sun. The strength that we contain within us can literally move mountains. May we be strong and also vulnerable. May the wild woman be set free. Samhain, the time of the ancestors, is a potent time for me. I love the quietness of the earth, and the potent earth energies beneath the ground. This year as in years past, the pictures of witches and goblins started to emerge, as well as scary stories and movies and images. This year I started to question the whole paradigm of fear around this time of year. What is everyone so scared of? Why are people so scared of witches and ghosts? What has happened to our culture so that something so powerful, in my experience, can be seen as being harmful and evil. When I started studying the wise woman tradition of healing, a woman I was carpooling to classes with said she was a witch. I was afraid and I was intrigued. I didn’t know anything about real witches, only the fake images of evil beings worshiping satan. I started to meet more witches and learned about Wicca and paganism and celebrating the earth in the seasons. The reason I set out to write this piece is because of the fear that is associated with Halloween. I must admit I was afraid of telling people that I was studying Wicca. They may think I am evil. In spite of fear, I began a women’s circle with other women from my herbal class. We did ritual, sang and stirred up some pretty powerful energies. It has been twenty years since I first became a shamanic herbalist. My studies took me to New York to study with Susun Weed and 15 years ago I started studying and practicing shamanism. I have been initiated as a green witch. The practice of the green witch is simple. She has an intimate relationship with the plants. They are her teachers, her friends and they offer themselves to her for healing. The green witch has just a few plants with which she works. She knows each intimately. The green witch has spirit helpers that guide her practice. She knows how to access the invisible realms. She knows how to travel to places in the spirit realm and how to return. She often visits this invisible landscape to cultivate her power. The green witch’s focus is on living in harmony with who she is truly, and on being of service in alignment with this. Halloween is the time when the green witch reaches the depths of the underworld. She navigates the depths of the inner realms and brings wisdom back to share. There is potency here as she investigates through the darkness. She is guided by her power animals and spirit helpers, listening deeply to the songs given to her by the plants to help her navigate. There is no fear in this journey. There are no bad guys. There may be beings that stir the cauldron to create challenges for change. She surrenders to the transformations needed to become more and more of who she is. There is complete trust. In order to live this way, it takes practice. Susun Weed says it takes seven lifetimes to become an herbalist. I understand this because of the great fear I have felt in claiming to be a witch and a shamanic herbalist. We have created a culture of fear and Halloween is a time to exploit that. The real images of witches are women that work with the powerful earth energies to heal and to bring about change. They are herbalists, midwives, doctors, nurses, dancers, actors, artist and healers. The spirit helpers like Baba Yaga and Hecate, witches who’s images have been distorted into evil women who cast spells on people. But in reality, these goddesses are not evil. And they are not nice! They stir things up and teach about power, real power. I am feeling called today to remember who I am. To trust in the Goddess to guide me deep into my psyche, into the deepest, darkest forest, to explore the places that require healing and transformation.